OpenStack is an open source cloud operating system, and OpenDaylight is a Software Defined Networking (SDN) controller. Despite being designed to work together, system complexity, architectural design, and limited testing have resulted in a brittle integration. 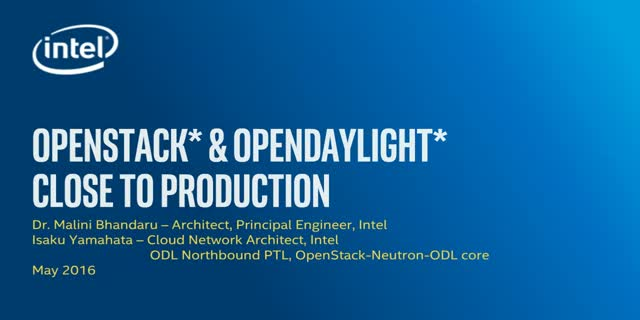 We discuss enhancements in the latest releases of OpenStack, code named Mitaka, and OpenDaylight, code named Beryllium, to address several of these issues. These pertain to database synchronization code to prevent race conditions, which paves the way to run multiple controller instances for high availability, support for connecting to external networks, additional tests to increase code coverage, bug fixes galore, and last but not least, the introduction of a lightweight test framework to speed testing and ease development. We wrap up with a discussion of future plans and invite the community to engage, both to use OS + ODL and influence its design and features.